This might sound a bit dumb, but I just can't create a selection using the lasso tool. Tutorials on YouTube tells me to press enter or double click after I've finished selecting an area using the free select tool, but that doesn't work, instead it just resets the free select tool. I can use the path tool to create selections, but for some reason the free select tool is not working for me. Has the keys changed for version 2.10.6 of GIMP? Select the Free Select Tool (lasso). In the Tool Options there is a Mode option. Make sure the first one (Replace current selection) is active. You may have Subtract active. Create your selection. Then press Enter or double click inside the selection. And make sure View>Show selection is active, too. (09-13-2018, 06:14 AM)Blighty Wrote: Select the Free Select Tool (lasso). Thanks its working now, but there's another problem immediately after. After I select a part using a lasso tool, it seems to become transparent on the edges, is this an intended effect? Or is there a way to shut this down? (09-13-2018, 01:59 PM)Audrey Hossain Wrote: After I select a part using a lasso tool, it seems to become transparent on the edges, is this an intended effect? The selection tools by themselves don't alter the image in any way. The selection is indicated by a moving dotted line (marching ants). This indicates which parts of the image can be acted on. 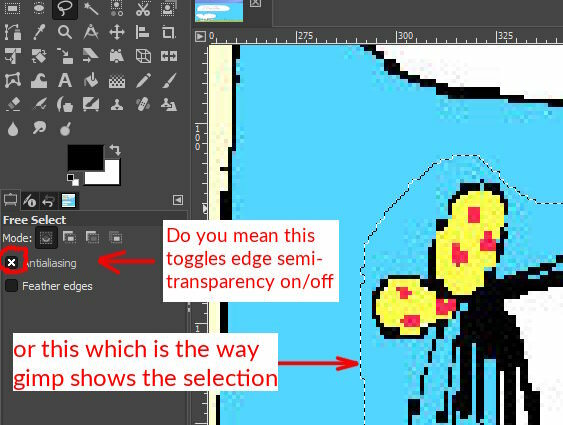 Making a selection doesn't produce transparent edges. A bit more info is required. What is your workflow? ie what are you doing before and after making the selection? Have you actually copied (or cut) a selection then pasted somewhere and found that there are semi-transparent pixels around the border? In that case turn the anti-aliasing off. It will look horrible. Thanks I actually had anti aliasing turned on. Now it works fine. Thanks.